Our new Evolution bifolding door is one of the latest bifolding doors in the UK market, with a host of benefits and options. 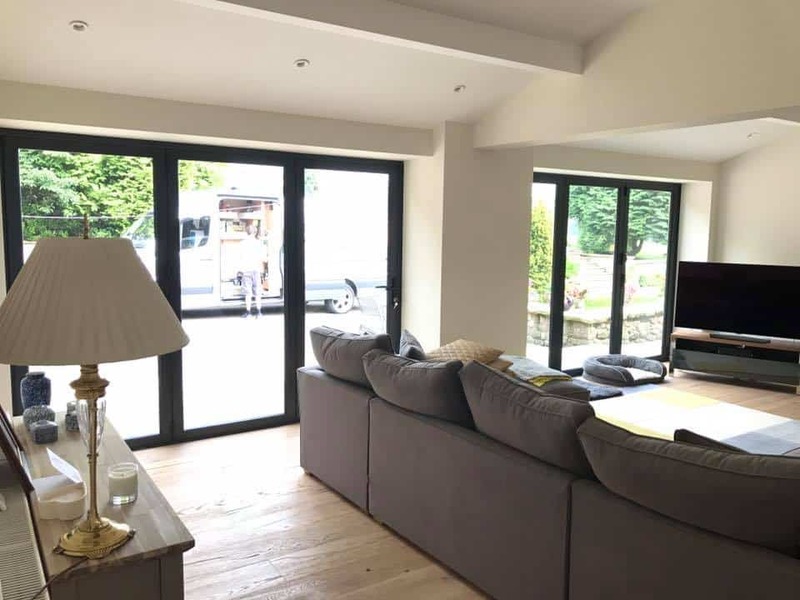 As a specialist bifolding door provider, North West Bifolds give you the biggest choice of the best bifolding doors for your home. Why Choose an Evolution Bifolding Door? First of all, the Evolution Bifolding Door is one of our slimmer doors when compared to all our other brands of bifolds. With a contemporary appearance, insulated aluminium sections and quality hardware, this is ideal for your new extension or home improvement project. The Evolution bifold from North West Bifolds is designed from scratch, improving your home with a quality folding door in aluminium. Best of all, it is affordable and professionally installed by us. Features of Evolution Bifolding Doors. Fully adjustable frame jamb ideal for newly-built structural openings. Ideal as a replacement for your old patio doors. Ultra-slim sight lines of just 133mm. High-quality components for a smooth operation. Available in almost any RAL Colour. Ideal for large door openings. As a premium quality folding door, the Evolution has great security thanks to multi-point lock with a durable contemporary door handle. The slave leaves lock via double shoot bolts for added peace of mind. To cater for the bigger and taller bifolding door, the Evolution bifold comes with door sizes of up to 1200mm wide and 3000mm high. Consequently, a large size capability means bigger glass, fewer door panels and better views out to your garden. You can choose from open in or open out doors, folding to the left or to the right. Furthermore, for added convenience, our door comes with a convenient traffic door. Traffic doors operate just like a regular hinged door meaning you can use your new bifold door all year round. Therefore, no need to fold the panels back every time. Above all, the designers of this latest bifolding door also design door handles and hardware found on some of the best and most luxurious doors on the market. This new bifold is no exception with a great pedigree as a result. Colour-matched handles and door magnets. Double glazed with standard glass or our integral glass blinds. Independently tested to PAS 24 for security and the latest Document Q for new build homes and extensions. Weather tested to BS6375 Part 1. Therefore great weather performance. At North West Bifolds, we specialise in the latest aluminium bifolding doors and helping you improve your home. Contact us today for a no-obligation quotation and to find out more.